Royal Canin Medium Adult is a complete food developed to support medium breed adult dogs 12 months and older. Royal Canin Medium Adult is a protein-rich complete food tailored to medium breed dogs. Packed full of nutrients, it helps to support their natural defences while satisfying their appetite. An exclusive formula of high-quality proteins and fibres makes this food highly digestible – essential for dogs so they can absorb all the nutrients they need from their food. A high-fibre content also promotes good stool quality and can really help if your pet has an upset stomach. Antioxidants and mannan-oligo-saccharides support your dog’s natural defences to keep them happy and healthy, while Omega-3 fatty acids encourage healthy skin and a glossy coat. Royal Canin Medium Adult is made using a carefully developed balance of tasty ingredients specifically chosen to keep medium breed dogs satisfied. made with a balance of ingredients chosen specifically to satisfy the appetite of medium breed dogs. 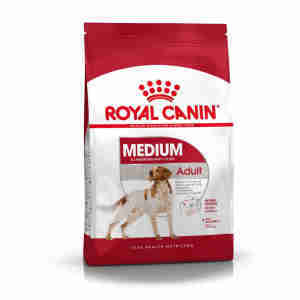 Royal Canin Medium Adult is perfect for adult dogs of medium size. If your dog is between 11 to 25 kilograms and one to seven years old, this complete food is packed with nutrients specifically chosen to meet their needs. To give your dog’s natural defences the best support, you should feed them Medium Adult food twice daily. Check the feeding guidelines and be careful to give them the right amount of food for their weight. If you notice your pet gaining weight, adjust their daily amount slightly. Consult your vet if you have any queries about the amount of food your dog needs. Ingredients: dehydrated poultry protein, maize flour, maize, wheat flour, animalfats, dehydrated pork protein, wheat, hydrolysed animal proteins, beet pulp,fish oil, soya oil, yeasts, minerals, hydrolysed yeast (source ofmanno-oligo-saccharides). ADDITIVES (per kg): Nutritional additives: Vitamin A:12000 IU, Vitamin D3: 800 IU, E1 (Iron): 46 mg, E2 (Iodine): 4.6 mg, E4(Copper): 9 mg, E5 (Manganese): 60 mg, E6 (Zinc): 181 mg, E8 (Selenium): 0.12mg - Preservatives - Antioxidants. ANALYTICAL CONSTITUENTS: Protein: 25% - Fatcontent: 14% - Crude ash: 5.9% - Crude fibres: 1.2% - Per kg:Manno-oligo-saccharides: 0.5 g - Omega 3 fatty acids: 6 g including EPA/DHA:3.1 g.
Our pup was fed on the brand she’d had at the breeder but when she reached junior food stage, she went right off it. Our other dog has been on Royal Canin for years so tried pup on that and she’s scoffed every meal since. I’ve no idea why she likes one brand over the other just glad we’ve found one she loves. Also very convenient to buy both from Medicanimal as service is always reliable. Always a pleasure dealing with Medicanimal, My boy loves the food and the service and delivery is second to none. Royal Canin is enjoyed by our w.c. spaniel --competitive price . Good product, good price, prompt service. Thank you.